Whether you're visiting for the day or staying overnight, there's so much to see and do along International Drive and the surrounding areas. Here are some tips for getting around the Convention Center District. Choose a tab below related to your reason for visiting. There's plenty to do in the Convention Center District and along International Drive, the heart of Orange County's tourism corridor. Depending on what brings you to the district, there's a good chance you could park your car once and explore everything our neighborhood has to offer by foot. Pointe Orlando offers a mix of dining, retail and entertainment experiences. An on-site parking garage, and the option to valet your vehicle, make navigating that portion of the International Drive corridor that much easier. ICON Orlando 360 is home to some of the newest dining and entertainment options within the Convention Center District. Parking at ICON Orlando 360 gives you access to top-tier attractions like ICON Orlando, Madame Tussauds wax museum, the StarFlyer and Sea Life Aquarium. The under-construction Hollywood Plaza garage gives guests at Mango’s Tropical Café a secure place to park while they dance the night away. The top floor of I-Drive’s newest parking garage will also be one of the district’s newest dining destinations. Information on that dining option will be released when it is available. Parking rates to be determined. I-Drive isn't the popular destination it is because we turn the lights off at 7 p.m. Between the convention center, top-tier attractions and endless eating options, I-Drive is the place to be any time of day. Of course, we know being home to amazing celebrations and events means more traffic. Here’s a District Crowd Calendar that will tell you what kind of traffic you can expect when you’re visiting our destination. On any given day, the Orange County Convention Center operates like a small city. To learn more about what we do here, check out the rest of our website. We know there are plenty of ways to get around I-Drive, but here are the taxi companies approved to operate at the convention center, meaning you can trust their drivers and know you're in good hands. With Central Florida growing so much, our infrastructure and roadways are being upgraded to meet the ever-growing demand. Here’s the latest information on construction happening around our corridor. Whether you're coming to the district in your personal vehicle, taking a taxi in or riding the local Lynx line, there's even more ways to get around International Drive once you're here. As an employee of the district, you pay a reduced fare when you ride the I-RIDE Trolley! One way to avoid traffic on International Drive is by only getting onto the road when you’re near your final destination. 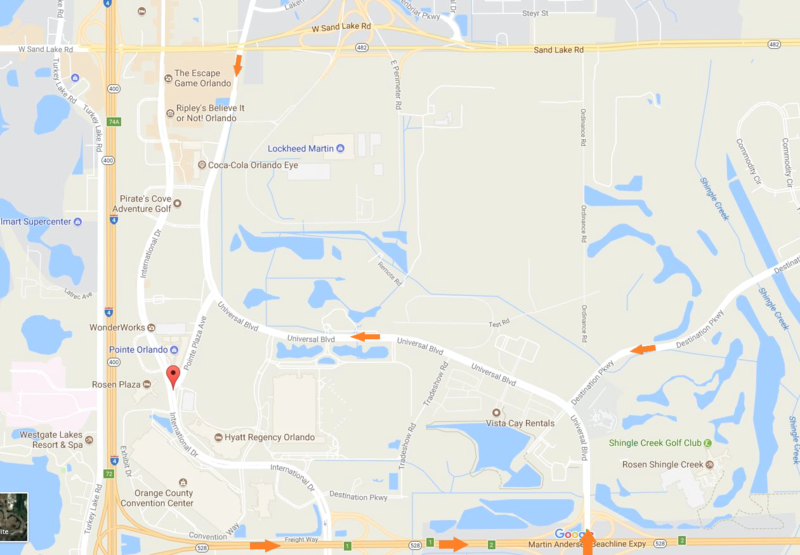 Some alternate ways to get here include Universal Boulevard, which runs parallel to I-Drive, and connecting to the district from the State Road 528 (Beachline Expressway). The new Orange County Pedicab Ordinance goes into effect January 1, 2018. Per the ordinance, all pedicab operators in the International Drive Tourism Corridor will now need to be permitted. Complete details about the ordinance, including the applications for a Pedicab Owner Decal and Pedicab Driver's Permit, may be found on the I-Drive District website. Approved taxi companies operate through the Convention Center District, making sure our guests get in a car with someone who has already been vetted and keeps their safety in mind. Here are the current permanent taxi stand locations that exist within the District. Here at the Orange County Convention Center, stand locations vary depending on the show. The latest information will be made available and shared with our approved taxi companies at that time. If you’re a ride-share operator (with either Uber or Lyft), we ask you be courteous of other drivers and don’t make every corner your personal pick-up and drop-off location. Approved stops at the Orange County Convention Center are listed in the Uber and Lyft apps. If you’re planning to explore the Convention Center District on foot, the best way to stay safe in that journey is to cross a bustling International Drive overhead. Equipped with five pedestrian bridges, connectivity at the Orange County Convention Center could not be easier. It takes everyone paying attention, visitors and motorists alike, to make sure every pedestrian in our district safely crosses our busy streets and intersections. Motorists: Pay special attention to all signage and slow down every time you’re approaching a crosswalk. Pedestrians: Look both ways multiple times. If you're planning to explore the Convention Center District on foot, the best way to stay safe in that journey is to cross a bustling International Drive overhead. Equipped with five pedestrian bridges, connectivity at the Orange County Convention Center could not be easier.